This T-bar jewelry display has a size of approximately 267 x 210 mm, and it offers two bars for displaying your precious jewelry and accessories. The design is simple, yet modern and elegant, as the bars are placed in opposite corners of the square base of this display. This allows you to create a magnificent arrangement with your bracelets, watches, and necklaces, to make them attract the views and to be clearly visible to those who want to admire them. When you own a jewelry store, it is always important to know how to impress your target audience, to increase the chances to attract more buyers to your store. 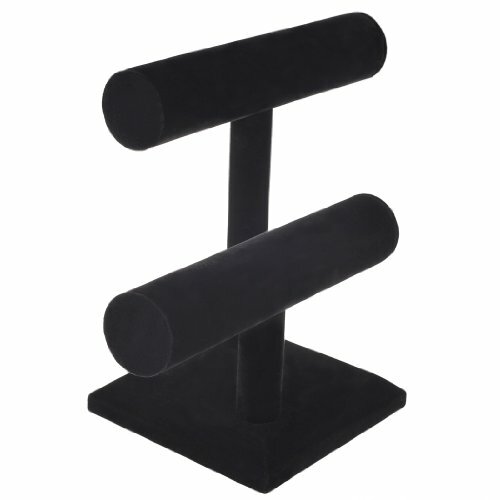 One of the best options to make a first good impression on your potential customers is to use this 2 Tier Black Velvet T-Bar Jewelry Stand Display. It is excellent for holding bracelets, watches, anklets, and necklaces. 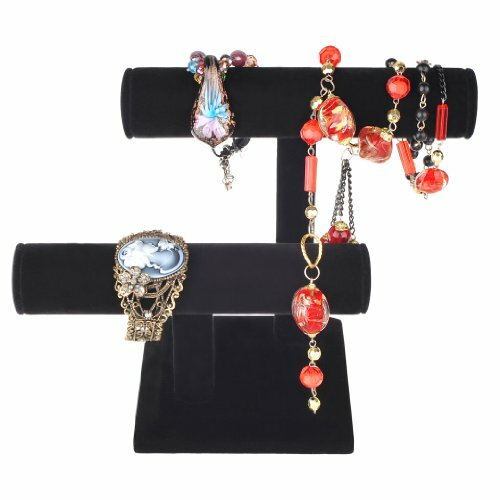 You can easily place this jewelry display rack on the countertop, on the shelf, in the storefront window, or even in your own room, on your personal dressing table. The two bars of this display are of different heights, to allow you to easily maneuver the jewelry and accessories, and to get a clear view of all the displayed jewelry and accessories. The two T-bars are placed on a square base, which gives a great stability of this display stand. This display is covered in black velvet, to protect your bracelets, watches and necklaces from scratches. Besides, this black velvet gives a plus of style and exquisiteness to your sparkling jewelry. It creates the perfect background for your brilliant bracelets and watches.